I discovered that my overly rich pilot and main, which I thought were spot on, were actually very rich and concealed a lean midrange. So I've been and will continue to experiment with various setups. I used what I've read from other members and learned from my own experience so far to put this chart together. There will always be exceptions but I believe when addressing one circuit, setting the other circuits to corresponding values will help maintain jetting balance, make fine tuning less of a mystery and avoid overcompensating for a lean area. pilot screw setting at 1.5, but will be tuned. Idles and sounds fantastic so far. The 52.5 pilot jet (not perforated) seems fine, since I can make the engine stumble before the pilot screw seats, and plenty rich and smelling like a refinery well before 3 turns out. Here's some of BurnPgh's detailed experiences and observation that he posted in the RSD "jetting help" thread. I wanted to post it here cause it's got tons of great info. .. In my experience, as far as the spacer goes, it really depends. Some people have removed their spacer altogether to have their bikes bleed gas out of the airbox at idle without touching the pilot jet(i think the airbox. I know people have reported gas bleeding out of somewhere due to this. No spacer works for my bike but it does better with 1 washer (and i suspect it will do better with 2 washers ie half spacer ) owing to the fact that Im too rich with a 55 bh pilot no matter what else is going on - back to 52.5 w/bh - with that im far out on the adjust screw but i have managed to eliminate the shutoff backfire. 52.5bh and no spacer creates sluggish acceleration. Add to this a 155 main and it makes for an all around crappy ride. So I added a washer ( 52.5bh, 1 washer, 155 main) Mid range was much better but it was very apparent when the main circuit kicked in. Still no shutdown backfire. Changed the 155 to 152.5. Idle good, midrange good, main circuit kick in less evident but still noticeable. Switched the main to 150. This is where I stand now - 52.5bh,1 washer,150 main. I still have just the slightest hesitation on the main circuit. I did 4 plug reads between all this. Once for each circuit and the one im running now which still shows a bit rich. I ride mostly mid range so that tells me one more washer may do me good. I could go to a 147.5 main probably instead but while that may eliminate the rich midrange im pretty sure it would make the main circuit too lean. Only by a bit but Im in no hurry to burn up a valve like some have done. I feel another washer would lean the midrange to where it should be and lean the main circuit just enough. ... it's best still to pay attention to the bikes feel as well as do a plug read for each circuit starting with the pilot and working up. Still going to have to open the carb up a bunch of times and take the tank off a bunch of times. It all comes down to trial and error within a certain range of possbilities and Im not the only one thats remarked that this carb never seems to be JUST right. I believe someone here wished they made a 53.5 pilot and I would agree. Or a 148.75 main. If you're rejetting you're rejetting for economy or power. Suzuki's pretty much played out the economy side so...if your doing it for power you might aswell do it right and get the most seamless transition between circuits as possible, and thats no fun...although for me it became fun. With my raptor petcock i can go from seat on to rejetted and seat BACK on in about an hour with all circuits changed. I switched from no spacer to 1 washer in a friends driveway at a party in the dark in 45 minutes (I lost the remaining bits of lancers jet set. Too much wine). Im pretty proud of myself though. Dwarf - I'm guessing you'll want to drop to a 52.5 with bleed holes and adjust the mix screw, a 152.5 main, and 1-2 washers. No telling really without doing it step by step. 55, no spacer, 155 is pretty rich all around. I don't think you'll like it but it will probably run. 52.5 ad adjust will probably be good, with no spacer will probably be okay, with 155 main will probably be rich. Add 1 washer and you're pilot will probably still be okay with a mix screw adjust. You're midrange will probably be better. Your main circuit will probably still be rich. Add 1 more washer your pilot may still be good with mix adjust. If so your midrange will be even better. Your main circuit will be way to rich. You'll feel it bog down at high revs. Switch to 152.5 main. Hows that suit you? Do a plug chop on the main circuit. Still rich? Go to 150 main. Check the plug again on the midrange. If it's lean remove one spacer. I haven't done the plug chops yet but will do. A moderately lean midrange or main and a moderately lean or rich main can feel similar to those with not enough experience. Excessively lean or rich was obvious to me. For me to be sure about the moderately lean/rich conditions I had to make one much leaner and the other much richer and go for a ride. Then vice versa. Then slowly bring them back to center. I'm sure there are better methods but I guess I'm old school when it comes to that. The experience of test runs with the jets 180 out of whack clearly showed me the effect on this carb and bike. I was then able to better feel the smaller differences as I slowly began to dial it in. With no battery behind my carb I can make changes like a nascar pit crew! I'd love to know that I can judge and get it dialed in and then go back to the dyno next week and see that I was right on the money. Or how far off! OK, ride report! The carb confused me a little, because when I ran it briefly last night it seemed rich at idle, but today once I took it for a ride it would pop or bang at each shift (with the screw at 1.5 turns). I kept riding and adjusting the screw out until the afterfires stopped at 3.5 turns. So I guess I do need a richer pilot jet, or one with bleed holes (?) In hindsight, I'm glad I took the whole white spacer out and didn't add washers. The midrange flat spot (flat spot? engine used to sputter and surge like crazy till you got past it) is GONE. The low and midrange is good and juicy now. Wide open throttle, by my standards is downright scary. The engine runs MUCH cooler now that the white spacer is out, and the pilot jet is clean and somewhat dialed-in. I'm gonna keep it like this until I get the K&N filter and Lancer carb. Maybe just a tad richer on your pilot, possibly a 52.5 w/bleed holes 55 without and mixture screw only 1 turn out, but it sounds like you've got it pretty close. Between shift pops are normal. Between shift loud bangs are more likely exhaust related. Whatever the cause, all banging (or just embarrassing loud pops) are gone now. The dyna pipe is a lot less restrictive (and louder) than I expected, but there was still the occasional bang with the suzuki muffler. I will stop messing with it for now because there's nothing else I can do with the stock carb and jets.. already at 3.5 turns and no spacer. I didn't expect further richening beyond 3 turns. Luckily there was a small effect going from 3 to 3.5 turns, a bonus my neighbors will appriciate. You running stock airbox and filter? Does your dyna still have the plate inside in the middle of the baffle or can you see straight thru it? The dyna muffler is still in stock condition, full plate in the middle. I was considering a 1/4" or so hole in the plate.. not necessary per Lancer's advice and confirmed by my ears. The airbox and filter are stock for now. I have a K&N panel filter ordered, and may cut or drill the airbox. But not so much as to ruin any dust settling/prefiltering it may do. Once I have the K&N added I will have some good feedback for the stage 4 section of your chart. 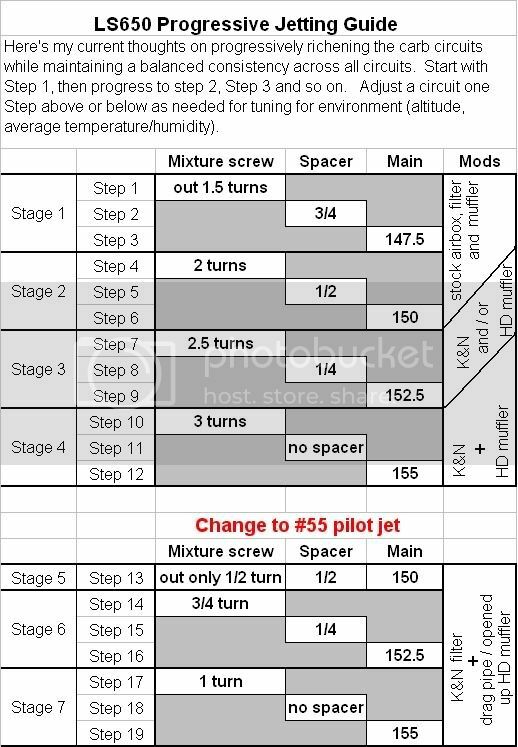 I can almost guarantee that the pilot jet won't handle it and will need bleed holes or increase to #55 or 57.5. I'd much rather have a richer pilot jet and the fuel screw at 1.5 turns, so I have a good range for fine tuning. If anyone has spare pilot jets to sell or donate in the interest of science please let me know. 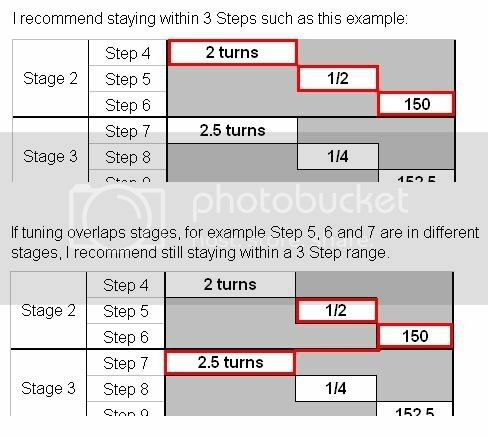 I might need to move the entire pilot column up a stage meaning making 2 or 2.5 turns the start and changing to a 55 earlier. BouleTard, thanks for all of your detailed feedback. There are small round or square supplementary foam filters that are designed to insert into holes drilled into the air box like you want to do. You can get them very cheaply at Thunder Products or from Sudco. If you need part numbers I can add that later. the air box. The foam filter air element may be cleaned and re-oiled. For Street, Dirt, ATV's, etc. Yeah I've thought about those things, as well as other options like sawing out a piece of airbox and replacing the hole with foam backed up with hardware cloth. But then I think nah, I don't need to be pulling and cleaning a bunch of pre-filters along with the filter. Hopefully the stock paper element is the bottleneck, and replacing it with the K&N will be enough. Since K&Ns load up and lose their effectiveness quickly, I'll just clean it when I change the oil. Say Lancer, when you convert from a CV carb to one of your roundslides, does the jetting change much? Completely different. Carbs are different in several ways and so jetting is as well. I send out most carbs that will be going on a stock engine with a #185 main jet and #20 pilot jet. The jets are a completely different series than those in a stock carb. My experience with my 2001 is somewhat different from Jim's. With stock intake and exhaust, I like the idle screw about 1-3/4 to 2 turns out, a spacer about 2mm high (vs. the white spacer about 2.7mm), and a 150 main jet. I tried spacer about 1.5mm and found no difference. I tried a 147.5 main jet and prefer the 150. When no difference is felt, I run leaner to see if there's any increase in fuel range. From this I learned that either the dyna muffler likes to be paired with less drag on the intake (you gotta uncork both ends anyway) and the smallest little exhaust leak will cause after-firing unless you crank the pilot as rich as it will go. This setup will be more than fine for now.. until I get my hands on one of those Lancer super-carb kits. Good info. I'm running the Dyna muffler, with the stock filter, and 2 washers on the needle. May have to look at removing them and see how it runs. I hate to go to a K&N, just because I've heard horror stories of people getting things gummed up (overoiling maybe). Is there a dry filter that flows better, besides cutting down an automotive filter?